BC Transit is disciplining drivers for not calling out stops to help the visually impaired — a practice the drivers' union says is unsafe. 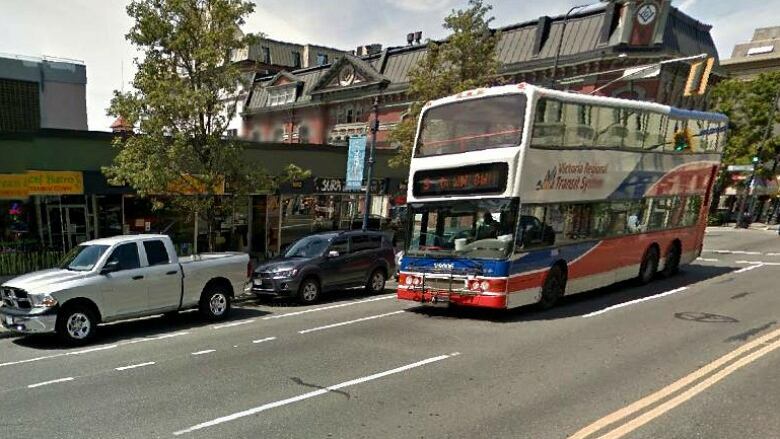 BC Transit — which operates buses outside of Metro Vancouver — has required Victoria bus drivers to call out all stops since April 2014, following a complaint to the B.C. Human Rights Tribunal. Bus drivers say the practice puts passenger safety at risk. "This is an undue distraction that the operators feel could definitely put themselves at risk as well as the riding public and the people out there on the road," says Unifor 333 President Ben Williams. Williams said the region has about 3,000 unique stops that drivers have to call out every 32 seconds, as well as contend with traffic and passengers. A paper prepared for the 2014 Conference of the Transportation Association of Canada suggested calling out stops is a distraction for drivers and causes more accidents. "We fully support the visually impaired's rights, but it's not fair to put the onus 100 per cent on operators," said Williams. BC Transit should pay for an automated system to call out the stops so drivers can concentrate on the road, according to Williams — something the company argues would cost millions of dollars. Elizabeth Lalonde, past president of the Canadian Federation for the Blind, said drivers should put more effort into accommodating the visually impaired. "If I get on a bus, like I have many times, and they're sitting there and they completely ignore me like I don't even exist, and that's how I get treated, it's an awful feeling," said Lalonde. Lalonde said it would be useful if the drivers at least called out the main intersections. Williams agreed, but said BC Transit has told operators they have to call out all the stops as they're written on the schedule, not just the intersections. He said a bus driver was recently suspended for not calling out all the stops on his route. To listen to the full interview, click on the audio labelled: Unifor 333 President Ben Williams on why Victoria bus drivers won't call out stops.